Stuck in a breakfast rut? Spend a bit of time over the weekend whipping these up and have breakfast mostly sorted for the whole week (or save them for snacks or for a guilt-free dessert). For breakfast, I’d suggest you pair a muffin with a protein (egg, cheese, yogurt, edamame, or spread the muffin with some nut butter). The addition of a veggie on your plate would be a great idea too. * No apple pie spice? No problem! You can make your own; just add 1 tablespoon ground cinnamon, 1 teaspoon ground nutmeg, 1 teaspoon allspice and 1/2 teaspoon ground clove. If your spice pantry is spare, just use 2 teaspoons of cinnamon. Preheat oven to 350°F. Spray a 12-cup muffin pan with non-stick cooking spray (cupcake liners stick to them pretty badly). In a large bowl, stir together oats, baking powder, seasonings and salt. Add applesauce, grated apple, egg white, maple syrup, vanilla extract, milk and cranberries, plus any optional additions. Stir well to incorporate. Allow the mixture to set and thicken for about 3-5 minutes before spooning into your muffin pan. Fill muffin cups almost completely full with batter. The muffins will not rise. 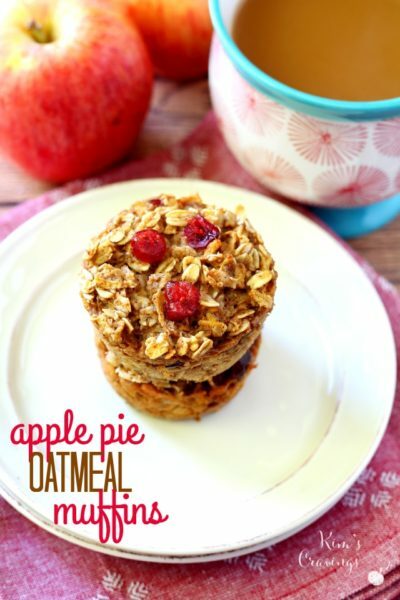 Bake for 30 minutes and until the center of each oatmeal muffin is set. Allow to cool for 10 minutes before serving. If you don’t allow these to cool before taking them out of the muffin pan, they will fall apart. I used a knife around the sides to make removal easier. After cooling, they will set well. Store in a covered container in the fridge for about a week or freeze for up to 3 months.